Large crossovers with three row seating have become the new favored family vehicle, supplanting minivans. One of these vehicles is the Ford Flex. 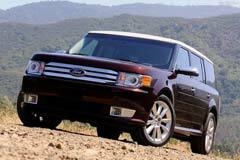 If your interest lies in a used Ford Flex the first model year was in 2009 and the car is still manufactured today. Some compare the Flex to minivans, but they are more reminiscent of an oversized version of the traditional family station wagons of another era. You will find a used Ford Flex to be stylish with design elements such as contrasting roof colors. The body style is sometimes referred to as "boxy" but this is an intentional effect that allows the interior space to be maximized. Originally 3 models were offered: the upscale Limited, the SEL and the base level SE. In 2011, a "Titanium" version featured chrome wheels along with other upgrades. In its inaugural year, a 3.5L V6 with 262 horsepower was standard. In 2010, a turbocharged 355 horsepower engine became an option. The used Ford Flex works well as a nicely appointed family vehicle capable of holding 7 passengers comfortably. Its workmanship is excellent and it affords riders a very smooth journey as well. 2019 Flex SEL 2019 Ford Flex, White Platinum Metallic Tri-Coat with 47 Miles available now!